My daughter Aline is five years old and like most five year olds, she is going on eighteen. She is very social and loves to be the center of it all. I really have no idea (sarcasm) where that personality trait comes from. My daughter Aline proudly in front of her display of Armenia. So you could imagine her excitement when she found out from her music teacher that her dad is going to play some Armenian music at her school as part of a the multi-cultural night. (To be honest, I was equally excited for her and could only imagine how she felt). It was also my first entree into the world of helping my children display part of their rich cultural background. The Topouzian family has a rich and diverse background of culture. My wife is both Lebanese and French while I am Armenian. 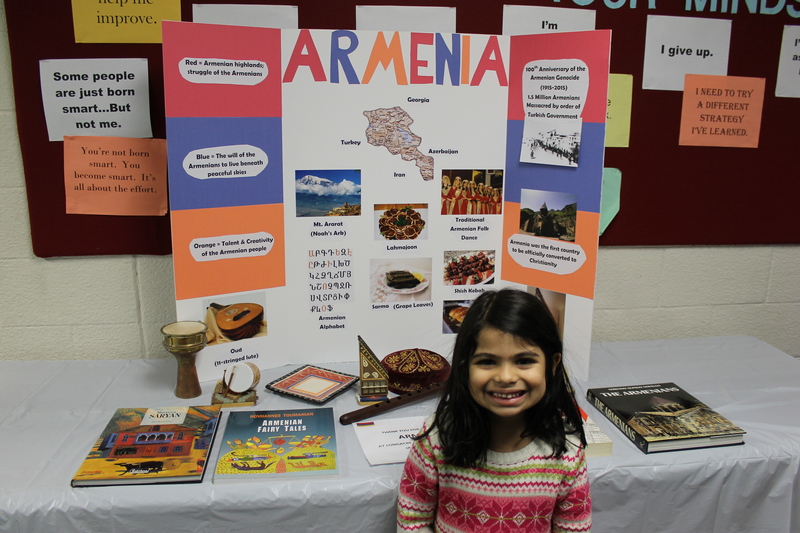 This time, we displayed information about Armenia and next time I hope we feature my wifes cultural backgrounds for the next event. I don’t remember having multi-cultural events at Aline’s age. What I remember was a elementary school teacher asking all the students to pick the country associated with their backgrounds in order to put a report together. Well, back in the late 1970s – early 1980s, Armenia wasn’t on the maps in my school and when I told my teacher I was Armenian, she didn’t know where that was and gave me – Turkey. Yup. Like a kid, I said, OK…close enough especially as I knew we had roots there. How do you think that went over once I got home from school?? My dad was …unhappy to say the least and a phone call was directed at the school. The next day….the teacher found Armenia. Playing music for my daughter was rewarding to say the least. She was excited and certainly wanted to show her dad off to her friends. 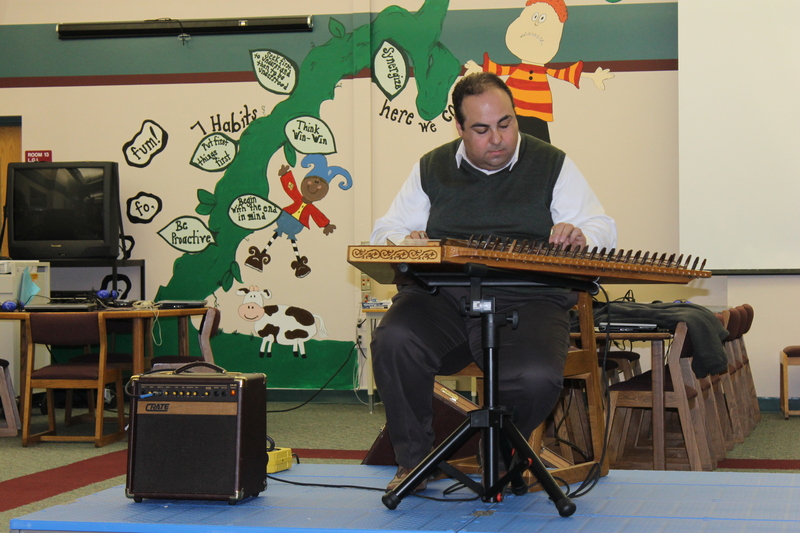 After all, how many parents come into a school playing music — let alone an unusual instrument and playing Armenian music? Playing music for Aline’s school. The funniest part had to be the questions I got from the audience. Remember, I played at an elementary school. The questions came from innocent and curious children. So..I played some music…and asked if anyone had questions. Immediately the little boy up front rose his hand. “Did you pay for that with your own money” he said. “How much money do you have?” I said. “Well, does your father have a lot of money? ?” I said. “Well, go ask him and then we’ll talk!” I said. Its going to be a long road for me I think. The best part? Aline smiled throughout. This entry was posted in Uncategorized and tagged Armenia, Armenian music, elementary school, elementary school teacher, playing music. Bookmark the permalink.